Hi LJ’s, I hope you all are having a good winter. Well, with three grandchildren, we got to that point in life where we needed more room at the kitchen table. 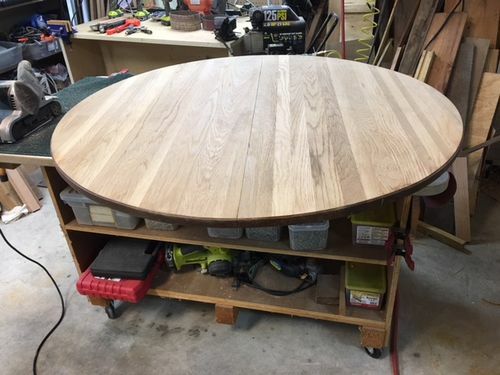 The existing tabletop was 60” round maple with a round-over from top and bottom. My idea was to a 24” leaf and re-profile the the edges to look more traditional than modern. I could not go much wider because the base was a pedestal style and it would not be stable. I purchased the table leaf extender from Rockler, which worked like a charm. I cut the table in half, built the new leaf and sanded to 220. To re-profile the edge, first I had to take a 1/4” off with a straight bit to give me a flat edge for the round-over bit to ride. Then I routed the profile with a nice detail. I finished it with Trans Tint Dye and wipe-on Poly. I ran into a lot of blotching problems with the original table sections, the wood they had used was not the best. They very cleverly hid that by spraying a tinted finish. After several attempts using different methods, I found that Charles Neil Blotch Control worked best. All said and done, I certainly learned a lot about finishing a large piece. Next time I may try spraying..
Nice job! That’s the kind of project where you never know what will come up. I ran into that blotching thing one time. Pulled my hair out trying to get a good finish. Yours looks great! The trials and tribulations just makes us better at whet we do. Thanks for the comments, guys. All ran smooth with this project until that blotching showed up -all over… I tried several times to get it right but could not seem to nail it down. Thank goodness I had LJ for a resource to see what others did to resolve this problem. It took about about two weeks for my arms and shoulders to feel normal again after all of that sanding! Lol. Nice work with the table. Turned out great. Just when you thought things may be downsized. I enjoyed what you wrote. It was good to hear the problems and then the solutions. 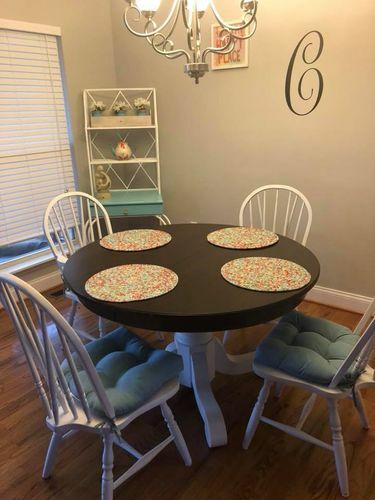 We just refinished a table this week for the daughter. This was not nearly as involved as yours. We learned a lot also and the family is so very happy with what we did. Yours turned out really nice. I understand taking our a little to make it so you could go with a new profile on the edge. Really great work. The finish looks great. Dave.. yes Just when I thought it was time to downsize, something amazing happened…. As I said we just stripped a second hand table and redid it to our daughter’s taste. Wow, “just stripped and redid” looks pretty amazing. I love the color and finish. great job! That is a beautiful table. Just one question, what is the diameter of the pedestal? I am building a 48” round table and can’t decide on how large to make the pedestal.